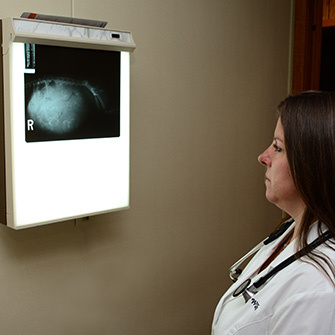 Iowa Veterinary Wellness Center offers its own in-house radiology equipment. X-rays provide invaluable information about your pet’s bones as well as soft tissues, like ligaments and internal organs. We also use the information for disease screening purposes, such as doing hip and elbow x-rays for OFA (Orthopedic Foundation for Animals) evaluation. We are able to do imaging studies (x-rays) on your pet in our facility for immediate review and to help facilitate a diagnosis. We are also pleased to be able to offer digital dental radiology equipment. Dental x-rays allow us to assess complete oral health, enabling us to visualize what is going on beneath the gum line. If you have any questions about the radiology services we offer, or to ask about what you should expect during your pet’s radiology experience, please call us.